Auscott was established in 1963 as a subsidiary of the J G Boswell Company. 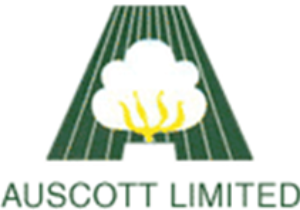 Auscott is a fully integrated producer, processor and marketer of cotton as well as a producer of wheat and other crops, mostly grown in rotation with cotton. The company operates over four valleys in New South Wales ensuring geographical diversification which is very important in spreading crop management risk. Auscott currently operates a total of six gins in the Gwydir, Macquarie, Namoi and Murrumbidgee Valleys, processing cotton for other growers as well as its own crop. Auscott was the first processor to undertake custom ginning of cotton purchased by independent merchants. Auscott continues to improve its ginning capabilities with some unique installations contributing to the maintenance of fibre characteristics in cotton. The company retains its position as the biggest grower, ginner and marketer of cotton in Australia, however it is better known for its adherence to quality related issues in shipments and enjoys the reputation as Australia's preferred supplier. Auscott has a total commitment to the Australian cotton industry that is well demonstrated by its participation in all industry bodies at all levels and especially in the research and development areas for fibre improvement and yield.